What are the most popular online bachelor's degrees offered in Connecticut? Connecticut has taken major steps to keep its online and distance learning programs up to national education standards. In 1998, the state launched the Connecticut Distance Learning Consortium, which provides support and services to educators using technology to broaden their learning opportunities. Today, most of Connecticut's top universities offer online degree programs and coursework, including Quinnipiac University, the University of Connecticut, Southern Connecticut State University, and Yale University. Additionally, the state has licensed more than more 200 online degree programs for operation, with a total of 46 degree-granting institutions statewide. While total enrollments in public degree-granting programs climbed 25.9 percent from 2000 to 2010, appropriations continue to sit below the national average. It's part of a trend that has seen tuitions at both public and private institutions rise steadily in recent years. As a result, many students are seeking online degree programs, which are typically more affordable than their on-campus counterparts. Residents of the state can choose from a wide range of professional and educational opportunities. St. Vincent's is one of the best online colleges in Connecticut for students looking to pursue a career in healthcare. The school offers two online degree programs: a bachelor of science in nursing (BSN) completion program, and a radiologic sciences program. The only time students must come to campus is for a student orientation in Bridgeport. All coursework can be completed remotely. Non-degree-seekers interested in taking online courses at St. Vincent's can opt for their certificate programs, which require a smaller time commitment but lead to credits that can be later transferred to a degree. Both degree and certificate programs at St. Vincent's use the Blackboard Learn online education portal to facilitate remote learning. The school offers technology support and resources to students as they use web materials to complete their courses. Founded in 1963 in Fairfield, Connecticut, Sacred Heart University offers various online programs, including several nursing degrees and a master's degree in social work. As one of the top online colleges in Connecticut, Sacred Heart’s instructors deliver coursework asynchronously to ensure that students can maintain their work and family obligations while earning a degree. The school provides both bachelor's degree and graduate degree options online. While each program structure varies, most bachelor's degrees -- such as the RN to Bachelor of Science in Nursing (BSN) -- feature eight-week course sessions. With a maximum of 90 transfer credits eligible, students can complete the bachelor's degree in 18 months. For master's degrees, students take classes over the course of 16 weeks and graduate in about three years. Sacred Heart requires bachelor's degree applicants to possess a high school degree with a 2.5 GPA. The school requires master's degree applicants to possess a bachelor's degree with a 3.0 GPA. In 1985, Albertus Magnus College introduced accelerated programs, offering learners a qualitative and flexible educational option. Over the last 30 years, the school added online programs, becoming one of the best online schools in Connecticut along the way. In addition to individual courses available online, the college offers online students 13 majors and programs to choose from at both the undergraduate and graduate level. Instructors deliver online classes asynchronously within eight-week sessions, and students can take one class at a time to accelerate the pace at which they graduate. Applicants with transfer credits can decrease their overall study time given that the school allows up to 90 credits with a 2.0 GPA or better to transfer. Once admitted, online students at Albertus Magnus gain access to career services, which offers workshops and career fairs throughout the year. Since 2001, Quinnipiac University has been offering online courses to students. Over the years, the school has finessed its program to offer three highly regarded online bachelor's degrees. Each program is designed with flexibility in mind to support students working full time jobs. As such, Quinnipiac provides an array of support services accessible every day of the week. These resources range from technical help to billing questions. All online students can also connect with academic advisors who assist students with course changes, elective options, and online degree program pacing and completion timelines. One feature that makes Quinnipiac University stand out among Connecticut online colleges is its online summer courses. These courses are specifically designed to allow students -- both online students, and those earning their degree primarily on campus in Hamden -- to catch up or get ahead on required or prerequisite courses in their degree program without being on campus during the summer. Of all the online colleges in Connecticut, Bridgeport's distance learning program is particularly well established. The school, based out of Bridgeport, has been offering online courses since 1997. Today, remote students can choose from four online bachelor's degree programs, several of which have tracks to select from and specialize in. Within its programs, students are assigned a full-time academic advisor who will provide help with course selection and support students in graduating on their desired timeline. Those enrolled in the school's online program use the web-based learning tool called Canvas to complete their work. Through this portal, students take their classes following either a 16-week format or accelerated eight-week format. All courses in each bachelor's degree program are offered asynchronously to cater to students' different day-to-day schedules. Connecticut is one of the smallest states in the U.S. by size, however it is also one of the most densely populated; Connecticut's Hartford-Springfield region is home to more than 25 universities and 160,000 students and is New England's second most populous area. While the state continues to boast one of the highest per capita rates in the country, the cost of living and of higher education have risen accordingly. In-state tuition for public and private universities increased by 28.9% and 26.1%, respectively, in the last five years. After a steady decline of four years, in 2014 Connecticut expanded its budget for higher education programs to increase spending on state programs by over 7%. Of Connecticut's estimated 2014 higher education budget of nearly $676 million, the largest percentage (44.5%) was allocated to the Connecticut State Colleges and Universities system under the Board of Regents, responsible for facilitating the majority of both on-campus and online programs for college students in the state. 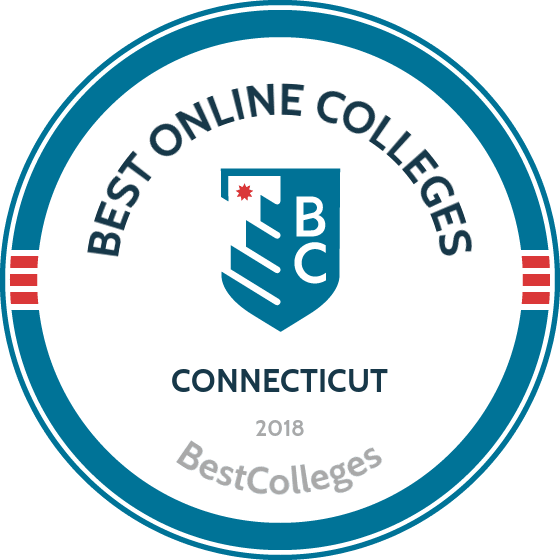 Browse our list of the best online colleges in Connecticut for more insight into distance learning programs in this state. Recent NCES reports indicate that 6.8% (14,701) of students enrolled in Connecticut's Title IV institutions were in exclusively online programs. The governing agencies over higher education in Connecticut have implemented several key initiatives to drive distance education in the state. Connecticut Distance Learning Consortium receives partial state funding to provide online education programs and resources for students in middle school, high school, secondary and postsecondary school. The Connecticut State Colleges and Universities system also connects students of all ages with comprehensive distance programs, available through both private and public Connecticut institutions. In addition, both the CDLC and CSCU support adult learning programs provide student-employer workforce solutions. Employment growth in this profession is moderate in Connecticut. According to the Connecticut Department of Labor, long term projections show an increase of 5% in the total number of jobs between 2014 and 2024. Wages increased by 3% from 2011-2016. In Connecticut, what were the top careers in 2016 for people who had a degree in registered nursing? Data source: Connecticut Department of Labor, Bureau of Labor Statistics. Data may not be available for every year. In Connecticut, employment growth in this profession is strong. According to the Connecticut Department of Labor, long term projections show an increase of 19% in the total number of jobs between 2014 and 2024. Wages increased by 2% from 2011-2016. In Connecticut, what were the top careers in 2016 for people who had a degree in business administration and management? Employment growth in this profession is poor in Connecticut. According to the Connecticut Department of Labor, long term projections show a decrease of 1% in the total number of jobs between 2014 and 2024. Wages increased by 12% from 2011-2016. In Connecticut, what were the top careers in 2016 for people who had a degree in criminal justice/safety studies?